CHICAGO (CBS) ― After a long summer vacation, students are usually back in the classroom on the first day of school. But community activists are urging Chicago students to play hooky instead. Imagine hundreds of Chicago school kids flooding the lobby of the Aon building for days in September, and the Chase Tower, and other downtown buildings. CBS 2’s Derrick Blakley reports that’s the newest tactic in the planned school boycott unveiled Thursday by state Senator James Meeks. “And I dare them to arrest our children and send them to jail because they want a quality education,” Meeks said at a Federal Plaza rally. Meeks and other black ministers repeated the first day school boycott is on for Sept. 2, with scores of Chicago students heading to New Trier High School in north suburban Winnetka to underscore disparities in school funding. “When people say money doesn’t matter, it just verified the importance of us going to New Trier,” said the Rev. Ira Acree of Greater St. John Bible Church. Then, from Sept. 3-5, Meeks plans to have kids descend on corporate offices. The idea is to force big business to back equal education funding, they way they’ve backed a Chicago Olympics. Downtown workers agree the tactic will draw attention. “It would be very disruptive but they’d make a point. They’d make a point,” Hallie Page said. CBS) CBS News Consultant Hoda Osman wrote this story for CBSNews.com. A 2-hour, 36-minute audio tape by al Qaeda’s number two Ayman al Zawahri was posted on a number of militant Islamist websites Monday night. The new audio is part two of the “open interview” series, in which al Zawahri responds to questions previously posted by different people online. Al Sahab, the self-proclaimed al Qaeda’s “media production company,” had invited those who would like to ask al Qaeda leader questions to do so through the Internet. Part One of the same series had been released in early April. In the audio, al Zawahri answers questions by over 60 people, many of whom asked several questions. He addresses the issues of Iraq, the establishment of so-called “Islamic states” in Iraq and Afghanistan, women and jihad, the Muslim Brotherhood in Egypt, Lebanon, the Israeli-Palestinian conflict, democracy and removing Arab regimes. Two questions were posted by people claiming to be from the press, including the Japanese Kyodo News Agency and a journalist from Norway. Four questions were posed by people claiming to live in the West, some of whom inquiring about the role they should play and whether they should travel to Afghanistan or Iraq or not. A number of people asked questions in English, which al Zawahri says he’s translated before answering. Al Zawahri, who read the questions himself, sounded impatient and dismissive at times. He asked several questioners to check his previous statements to find the answers and seemed disappointed they were not aware of every word he’s said or written. In response to one question about whether or not he had supported Hizbullah in a statement he issued during last summer’s war with Israel, he advised the questioner to listen to the tape herself instead of listening to what other people say about it. He also advised another person who asked ten questions to reconsider his secular ideas. This is al Zawahri’s fifth statement this year. His last statement was an audio tape released on April 17. Asked about who the real leader of Muslims is, the person who holds the title of “emir (prince) of the faithful,” al Zawahri explained that Mullah Omar was the “Emir of the Faithful” in Afghanistan and not all over the world, while Abu Omar al Baghdadi is the “Emir of the Faithful” in Iraq. As for the world’s most wanted man, al Zawahri repeats twice that Osama Bin Laden is “one of Mullah Omar’s soldiers.” As far as the leader of all Muslims, al Zawahri explains it will be the Imam of the caliphate that al Qaeda is trying to establish. Al Zawahri reaffirmed twice that there were no women in al Qaeda’s ranks.He said women help by enduring the hardships associated with frequent movements and difficult conditions as well as by raising their kids. Al Qaeda’s number two seems to contradict himself however when he responds to a woman asking if she should participate in jihad in the Maghreb countries. He responds by saying that as an obligation, jihad should include everybody, but that because in her particular case she has nobody she trusts to leave her kids with, she should not do it. Once More: Was Al Qaeda Really Behind 9/11? “Democracy essentially conflicts with sharia (Islamic Law), because democracy is based on the rule of the majority while shari’a is based on the rule of the law as it was sent down by God,” said al Zawahri in response to a question about the Islamic State of Iraq and democracy. Al Zawahri claimed Sunnis were a majority in Iraq, arguing that Kurds and Turkmans are Sunnis that should also be counted. He strongly supported the “Islamic State in Iraq” and its leader Abu Omar al Baghdadi and called for a dialogue with other groups that agree to the principle of establishment of the Islamic Caliphate. Why Not Attack the U.S. Navy? In a lengthy answer to a lengthy question that seemed to hit a cord, al Zawahri criticized the Egyptian Muslim Brotherhood’s program, pointing out that it refers to a secular constitution and mentions democracy 19 times. (He had pointed earlier that democracy and Islamic shari’a were incompatible). He also criticized the Muslim Brotherhood’s program for not providing any support to jihad or the mujaheddin and for indicating they accept the U.N. resolution, which he concludes would mean recognition of Israel. But in spite of his strong against the Muslim Brotherhoods, al Zawahri praised them for their position with regards to “liberating every inch of Palestine,” which he said was better than Hamas’ declared position in the Mecca agreement. Seven questions were asked about Saudi Arabia specifically. “As for Saudi Arabia, the tyrants, the Americans’ agents, should not rest in peace, we have promised God to fight the crusaders and Jews until we kick them out of our lands and establish an Islamic system,” he said, urging those who have the ability to choose their targets and go ahead with attacks. “Those who have the power should target U.S. forces and its allies that are based in Iraq’s neighboring countries.” In this section, al Zawahri also supports the Saudi Reform Movement (Al Islah), which is led by the Saudi dissident Saad al Faqih out of London. Al Qaeda Against Fath Al Islam in Lebanon? Al Zawahri’s answer to that question was vague. In response to a question indicating al Qaeda and the Islamic State of Iraq had asked people not to support the militant group, al Zawahri said it would be a shame to “let our brothers in Lebanon down.” Al Zawahri also predicted that Lebanon will play an important role “in the coming battles” and called on Lebanese people to go to Palestine to fight. A person claiming to be from the Japanese Kyodo Press Agency asked al Zawahri about his threats to Japan, even though it has only participated in reconstruction and humanitarian work. Al Zawahri argued that because it was all done under the umbrella of the coalition forces, it is considered an attack on Muslims. Al Zawahri was asked how many times he had met with Hizbullah leader Emad Mughniya who was assassinated last February. “I haven’t met him. This is a strange question and I don’t understand what’s behind it,” he said. Al Zawahri even addressed Global Warming in his lengthy audio tape, saying it shows how greedy Western countries are, pointing the finger specifically at the US, because of their reluctance to reduce gases. Al Zawahri mocked a research report published by West Point’s Combating Terrorism Center entitled “Militant Ideology Atlas- Research Compendium,” which has a passage about him joining the Muslim Brotherhood at the age of 14. The reference appears on page 359 of the document. 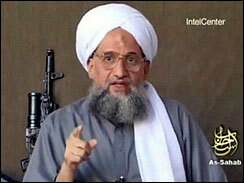 Al Zawahri says he never joined the Muslim Brotherhood. Democrats plan jail for Karl Rove ?